Riverdale sets up a gripping new mystery is what looks to be its best – and maddest – season yet. Warning: This contains spoilers for Season 1 and 2 of Riverdale, plus minor spoilers for Season 3’s opening two episodes. 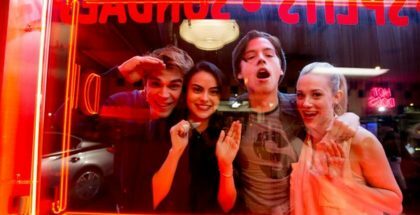 Since it began back in 2016, Riverdale has, at times, struggled to find its own identity. Or, at least, it appeared to struggle. The problem? It never knew what it wanted to be, so therefore decided to be everything. Murder mystery, serial killer drama, love story, a biker-boys saga, a tale of class conflict, there was even a very disappointing musical episode thrown into the mix. But now that we’re into Season 3 of the hugely popular series, has creator Roberto Aguirre-Sacasa been playing a blinder all along? Taking a leaf out of the world of comics rather than other art forms, by seeking to throw away all the rules and use constant reinvention as the primary tool of creative endeavour, Riverdale is a very busy show with so much energy to burn and an approach to storytelling that is pitched at breathless (or too rushed, take your pick). In other words, Riverdale is playing a very different game to other television shows around and the rules are a bit different. It all works (in general) because it’s brilliantly cast, superbly acted, addictive, silly, thrilling, hilarious (looking at you, Cheryl Blossom) and gorgeously filmed. The big thing to note about the first two episodes is that Season 3 is heading down the rabbit hole of the supernatural. This really shouldn’t come as a shock. Way back in Season 1, viewers keenly noticed Alice Cooper (brilliantly played by Twin Peaks alumni, Mädchen Amick) using white magic remedies around the house. Why – in a show that wasn’t a horror title – would such a peculiar moment be included? Cooper has never exhibited an interest in such things since, but why was it planted so early on? Season 3 will very likely provide the answer and establish there are folkloric horror aspects to Riverdale (which chimes with the launch of the spin-off, Chilling Adventures of Sabrina, a show about a teenage witch set in the Riverdale universe). The trend continued in Season 2, where one major narrative headed into serial-killer territory pell-mell and featured a wonderful homage sequence to David Fincher’s Zodiac (2007) – and saw the Cooper family torn well apart and changed forever. The show’s general atmosphere and vibe is curious, too. With its striking use of primary colours (heavily associated with Italian genre cinema of the 1960s and 70s), Aguirre-Sacasa has slowly but surely enveloped the world of Riverdale in horror vibes and touches. Season 3 is certainly going to get witchy. What looks to be a very clever bit of alignment with Chilling Adventures of Sabrina, the teenage witch who lives, don’t forget, in the next town over – Greendale, which has appeared as a locale several times in Riverdale – Archie, V, B and Jug are going to come up against some sort of woodland folk horror demon, by the looks of things. Exciting much? This could be a perilous course to take (once you step over the horror threshold there’s no going back), but then again, Riverdale is so postmodern, the kids will likely brush it off as just another crazy episode in their young but constantly fraught lives. At the end of S2, Hiram Lodge (Mark Consuelos), aka. 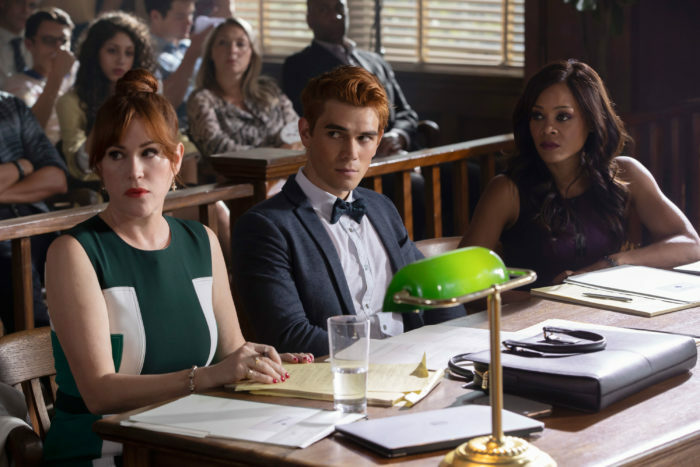 Riverdale’s answer to Scarface, had stitched up Archiekins (KJ Apa) for murder. With Red staring at a stint in juvie detention, what’s the rest of the gang going to do to pass the time? Investigate strange goings-on, that’s what! Riverdale is always fun when Jug (Cole Sprouse) and Betty (Lili Reinhardt) get their Nancy Drew on, and the opening episode (Labor Day) leads to several shocking twists and surreal moments, setting up a spooky new mystery to solve and toying with our expectations mercilessly. Will Sabrina Spellman, played Kiernan Shipka, drive over to Riverdale and help the gang out at some point along the S3 way? 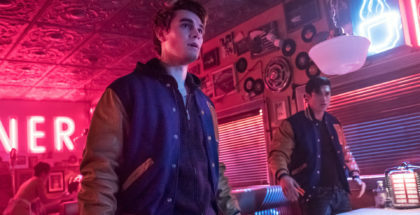 While we shouldn’t expect Archie and the gang to crop up in Chilling Adventures, by the time the spin-off has established itself, Riverdale Season 3 will be still be airing. The possibility is distinct. As seasoned fans will know, a lot of plot is crammed into the weekly 42 mins. 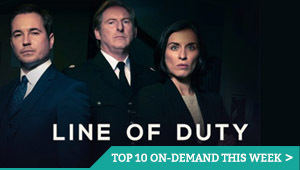 Alice joins a cult over the summer break, egged on by Polly, Archie ends up in court, Kevin and Moose sign up for what looks like a Thunderbirds convention (it’s really the police cadets) and Veronica tells her old man straight that she’s no longer his daughter. Not only was he totally responsible for setting Archie up, the evil capitalist also turns up at the detention centre (satirically named after Leopold and Loeb, two young killers from the 1920s) and makes Red’s life even more of a misery. Hiram’s living in a dream world, though, if he thinks Veronica will give up her Archiekins. She tells her beau about the big plan to help him, and goes to Leopold and Loeb sporting a ridiculous blonde wig and big hat disguise, giving her name at the gate as ‘Monica Posh’ (brilliant). Riverdale Season 3 is setting itself up to be the best – and maddest – yet. Riverdale Season 3 is available on Netflix UK, as part of £7.99 monthly subscription.